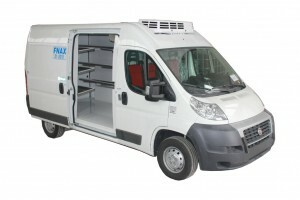 Banaglio makes insulation for Fiat Ducato refrigerated van. 3 wheelbases, 4 lengths, 3 heights. 7 volume options, from 8 to 17 m³. Sliding side door and rear door both available in 3 different size options. Maximum permitted axis loads up to 2100 kg on the front and up to 2400 kg on the rear. If you need to insulate your Fiat Ducato van contact us by sending an e-mail with the form on the right.